I can't register online for the event, what do I do? Please get in touch with us and we'll do our best to help. All Classic Challenge participants under the age of 18 will need a parent or guardian to register on their behalf and sign the terms and conditions. Entrants under the age of sixteen must be accompanied by their parents or legal guardians. Children aged between 10 and 16 can ride independently if accompanied by a responsible adult. Children aged 9 or under can take part in the Classic Challenge on a tag-a-long or in a children’s bike trailer. Persons with additional support needs are welcomed with their carers. Children under 16 can take part in the Wee Jaunt rides independently on their own bike, in a tag along or in a trailer if accompanied by a parent or carer. In all cases it is the responsibility of the child’s parent or guardian to determine the ability of their child to take part in Pedal for Scotland rides. Entrants must be aged 16 and over to register to take part. All Big Belter participants under the age of 18 will need a parent or guardian to register on their behalf and sign the terms and conditions. The Big Belter route is largely on open roads and we highlight that those under the age of 18 remain the responsibility of their parents or guardians at all times and strongly recommend that you ride together. Concessions - for those aged over 60, under 16 or those in full-time education. Can I buy event transport or a t-shirt if I've already registered? Please make sure you book transport in advance as it cannot be purchased on the day of the event. When will I receive my rider pack? The rider packs will be posted out to you around 1-3 weeks before the event. The starter pack will include your: entry number; bike number; route details; transport wristbands (if purchased), t-shirt (if purchased); all other information that you require to participate within the rider information booklet. Timing chips for the Big Belter riders will also be included in the starter pack. How does event transport work? Each participant loads their bike on to a truck in Edinburgh (each will be numbered) then heads to get the first available bus. Both bike and participant will be transported through to Glasgow Green at which point the participant will be able to collect their bike from the relevant bike pen (the same number as that of the truck). For security purposes each participant is given a vest number and a bike frame number. Upon arrival at the destination security staff will ask each participant to show their vest number and they will then be matched up with their bike. A successful entrant will receive confirmation emails detailing all participant details and a receipt of the amount paid. If not received there is a high probability that you have not been registered. 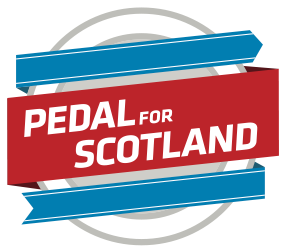 If you have any further queries regarding your registration please don’t hesitate to contact info@pedal.scot for further information. I can't make it to the event now - can I transfer my place or get a refund? Entry donations are non-refundable, as per the Terms and Conditions. Should you be unable to participate in the event or wish to cancel your entry your entry donation will be treated as a charitable donation and will not be refunded. If you have purchased bus transportation and are unable to attend the event or miss the allocated transport times your bus ticket will not be refunded and will be treated as a charitable donation.